BEAVERTON, OR-With an intricate AV network that includes three separate floors, eight different zones, and multiple audio and video inputs, Nu-Star Technologies outfitted Cheli's Chili Bar in the heart of Detroit, MI with a Biamp AudiaFLEX to provide employees with intuitive audio and video distribution controls and guests with an enjoyable, entertaining AV experience. Cheli's Chili Bar now has a Biamp AudiaFLEX that gives employees intuitive distribution control over the restaurant's 32 plasma screens, and much more. The requirements of the project were to route analog video signals to the 32 plasma screen televisions located throughout the restaurant's first and second floors and to the Player's Room VIP lounge. In addition to video signal distribution, audio from the satellite feeds and XM satellite radio feeds, provided via DirecTV, had to be processed and routed to the restaurant's more than 40 Soundtube speakers. At the center of this network is Biamp's AudiaFLEX, configured with 16 inputs and eight outputs. Housed in an MRK pull-out rack from Middle Atlantic Products, the AudiaFLEX works in conjunction with an Autopatch 32 x 32 central component switcher to distribute data from 11 video inputs: 10 HD satellites and one progressive scan Sony DVD player. The AudiaFLEX also receives input from a total of 10 receivers: three HD video receivers and one XM satellite receiver on the first floor; two HD video receivers and one XM satellite receiver on the second floor; and three HD video receivers in the VIP lounge. "We've found AudiaFLEX to be a very reliable component," commented Josh Evans, technical director at Nu-Star. "To date we have not had a negative experience with the product. From a configuration standpoint, AudiaFLEX gives us a wide range of programming options and the company's technical support staff is always on-hand to help us troubleshoot should we run into any problems. 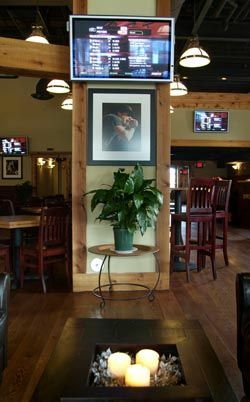 Cheli's Chili has a great atmosphere with some top-notch AV features that are brought together with a single AudiaFLEX." The AudiaFLEX afforded Nu-Star the ability to pre-program a preset for powering on and powering down the system. When powered on, the audio levels and video distribution begins at a predetermined setting, eliminating the need to manually reset volume levels when powering down. AudiaFLEX also allowed Nu-Star to program audio presets that maximize sound distribution in each of the restaurant's various zones. With the Audia software, Nu-Star also plans to program additional presets for pre-determined mood settings, including lunch and dinner/nighttime settings.